I am accumulating an impressive number of stripy tops but instead of saying 'ENOUGH woman! ', I find myself looking for variations on the theme to justify buying more. Two such variations have recently been added to the collection from the SS15 range at Hush so for all you stripy fans, I wanted to share them both...worn with khaki as that's my new favourite combination. I wondered if I'd gone too big with the 12 but having worn it today and asked opinions on Instagram, I'm happy with it. Yes, the 10 would have fitted me too...but the style of the top lends itself to being a bit bigger I think. 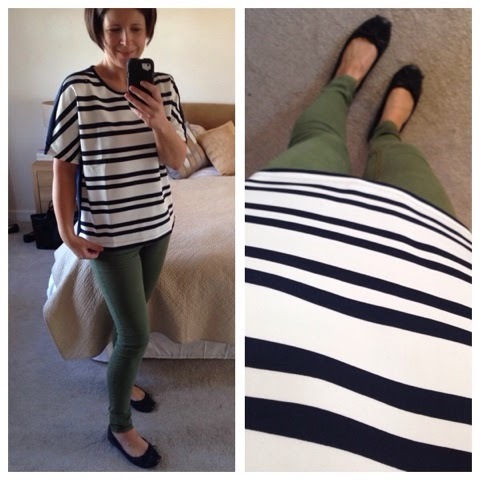 Next up, the Zoe Stripe Tee - which is a completely different offering. 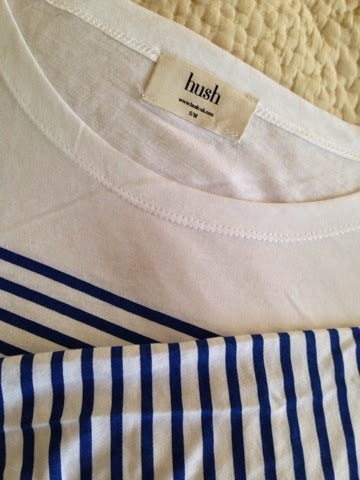 It's lightweight cotton jersey - like a t-shirt and the stripes in this case are printed on, not woven into the fabric. I kept this one as I like the bright blue stripes - a bit different to the usual navy and I liked the fact that the stripes are only across the middle of the body and the arms. The fit is perfect for me in the S/M - loose on the tummy but not too baggy so it will work with boyfriend jeans too. I also paired this with khaki but this time in the form of my Warehouse parka (past season). This top was sent as a gift from the Hush team but I would have bought it anyway...though don't tell them that! So you'd think between these and my Joules breton I got last week...AND all the others in the photo above, that I'm covered when it comes to stripes...but I find myself wondering about adding a bit of fluro to the collection for summertime??! 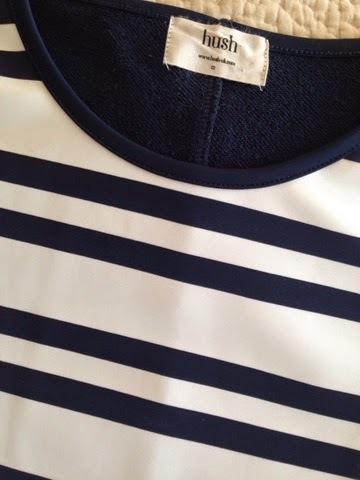 I defy anyone to look bad in a breton. Those two from Hush are as gorgeous as each other! I have not one breton top, not even the hint of one lol keep thinking about it and then forgetting lol they look great on you! Get the fluro one! I have a Maison Scotch one and I love the colour shock. Oh you're funny! 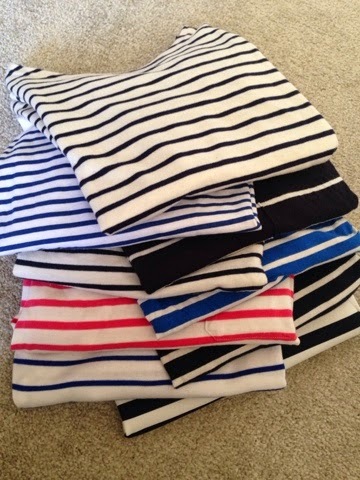 I've finally come to the realisation that breton style stripes do absolutely nothing for me, so I donated them all to the charity bag! 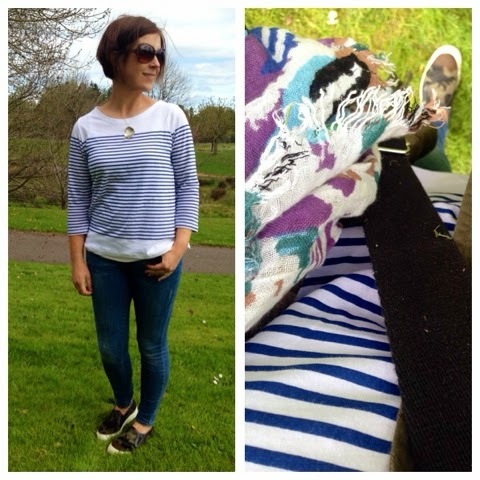 I almost feel like I should hand in my blogger badge now having admitted to a stripe-free wardrobe!! !